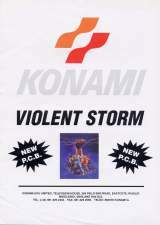 Violent Storm © 1993 Konami Company, Limited. Violent Storm is a sideways-scrolling beat-em-up for up to three players set in the aftermath of World War III. The survivors of the war are attempting to rebuild their world but are being terrorised by violent gangs . Three vigilante heroes called 'Boris', 'Wade' and 'Kyle' are trying to protect the citizens but are hampered in their efforts by the evil and corrupt 'GELD' gang. As the heroes are patrolling the streets, they see their friend, Sheena, kidnapped by the gang. The vigilantes must fight through seven enemy-packed stages to rescue their friend and destroy the gang. 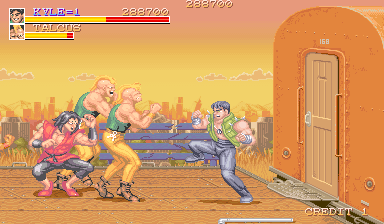 As well as the standard punch and kick moves, each character also has a special attack. This move is powerful enough to fell several enemies at once, but with the trade-off that each time a special attack is executed, some of the player's health is lost. Health levels can be replenished by finding the food that lies hidden in breakable crates and barrels. Some of the gang members will drop a weapon when they are felled. These weapons can then be picked up and used by the players. Destructible crates and barrels also contain weapons and random bonus items. Stunned enemies fall to the ground and can still be attacked while prone. Players: Up to 3 simultaneously. 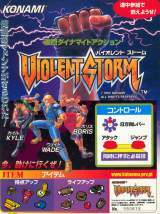 Violent Storm was released on July 26, 1993. The 4 stage boss is actually disguised as a Power Loader seen in the 'Aliens' movie and the Konami title of the same name! At the middle of the last stage, two cabinets of "Penta" and "Scramble" make an appearance (Note that "Penta" is originally a bootleg of "Pengo"). One of the bonus point items is a Twinbee doll. King Records released a limited-edition soundtrack album for this game (Konami Amusement Sounds '94 Spring - KICA-7631, 7632) on February 23, 1994.